Another Monday, another week, it comes round so quick! Today our final hallway inspiration is stylish black. Make an impact with your entrance. Black can be sleek, elegant and bold. You can create a crisp clean lined look, or a softer look by adding a few lighter tones or a highlight colour like silver or gold – add a few cushions on the sofa, a rug on the floor, a few choice ornaments on the console. Adding a mirror will ensure there is plenty of light in the space, as although the furniture is black, you don’t want the space to feel closed in and ‘heavy’. Below are a few stylish black pieces from Chichi, ideal for a hallway. 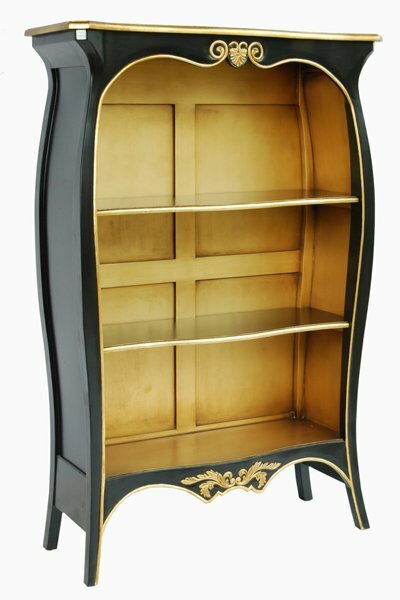 Both consoles have an elegant curved shape instantly adding character and one has delicate vine leaf detail which breaks up the solid block of black if you want a more toned down look. The stunning seat is upholstered in velvet which adds texture and depth and offers that luxurious finish, the silver detail makes it less intrusive, as also seen with the single chair edged in silver. If you have space, adding a bookshelf to an entranceway can be a great way to fill what can be difficult and sometimes wasted space. It can add interest and character too and again the collection of books itself can tone down the solid black. Today we are still talking Hallways, but this time we looking at French rustic style. This is possible one of my favorites. Country farm style pieces, creating an entrance way that instantly welcomes you in. Finished in modern pastel shades for that subtle touch of colour, with a distressed look added charm and warmth. Picture a beautifully natural stone clad floor, neutral coloured walls, beautiful solid wood doors and French style console tables or dressers – with spring flowers, a wicker key basket and candles. Add a feature chair or sofa to give a relaxed feel to the space and Voila – C’est Parfait! French Interior Design, Room by Room – A Grand Entrance! Today at Chichi Furniture, we are talking entrance ways/hallways. A room that is often neglected, yet is so important. Its the first impression people get of our homes so should be welcoming, warm and stylish. Granted, they can be tricky rooms, often small and awkward or vast and echoey. The best thing to do is treat it as any other room, rather than a through way. We will start with the ‘grand’ entrance way. That vast room that has the potential to make a huge impact as you open that front door, rather than being cold and characterless. Choose large ornate French pieces for this grand room, maybe add an upholstered chair/chaise to add colour and texture and ensuring a more relaxed feel. Choose rich, sumptuous colours, golds and silvers to add warmth to the large space and create striking visual impact as you enter the room. Hang a large chandelier to drawer the ceiling down. You don’t want the furniture to look lost or awkward, you want it to all work together, add a large ornate console and mirror, texture, colour and pattern will add to the charm of the space, but ensure you make it work together and don’t just plonk it in odd areas, make it a useable space. Don’t forget to look at the floor, adding a rug or tiling it in stunning decorative tiles can really complete a design, but make sure you keep a balance between patterns/colours, you want it to gel and not look chaotic. If you choose a heavily patterned floor, keep the upholstered furniture (if you choose any) simple, so its not lost. It’s Monday again and as life is flying by, so is the A-Z French Style Furniture from Chichi and today we find ourselves on ‘S’. ‘S’ is for Silver, sleek and stylish. A colour that is less domineering than Gold, but equally as stylish and a fabulous contrasting colour with black. Below are some stylish silver numbers form Chichi to help get those creative juices flowing in how to style up your home the silver way. Happy Monday everyone. 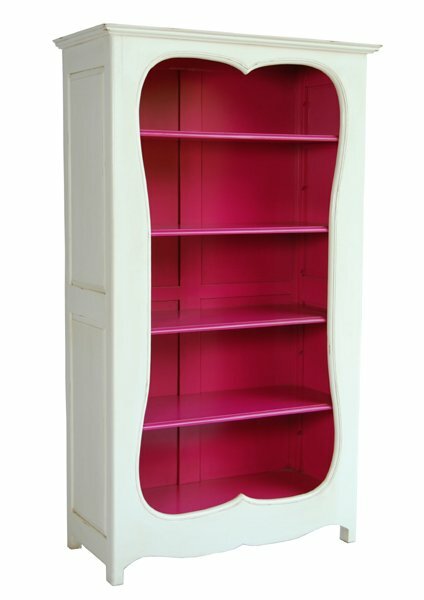 Today we are on the letter N and in Chichi Furniture’s vocab, that stands for the fabulous ‘Neopolitan’ range. Strong visual pieces with understated detail – these units aren’t fussy or flamboyant, but certainly not lacking in character. Each chest will have a strong presence in your home, either pulling a style together or standing alone as a central wonder – a stylish black unit with vivid contrasting drawers. These pieces are such versatile units – ideal for adding a touch of ‘Je ne sais quoi’ to almost any room. They would be a striking feature in a Hallway, a stunning focal point in a lounge, or a great piece for adding a touch of style to your kitchen, as well as having ample storage. Mirror, mirror on the wall, make my house the most stylish of all! Good morning. Its worked perfectly that today is Friday and today our letter is ‘F’. So its Friday Floral Features all the way! 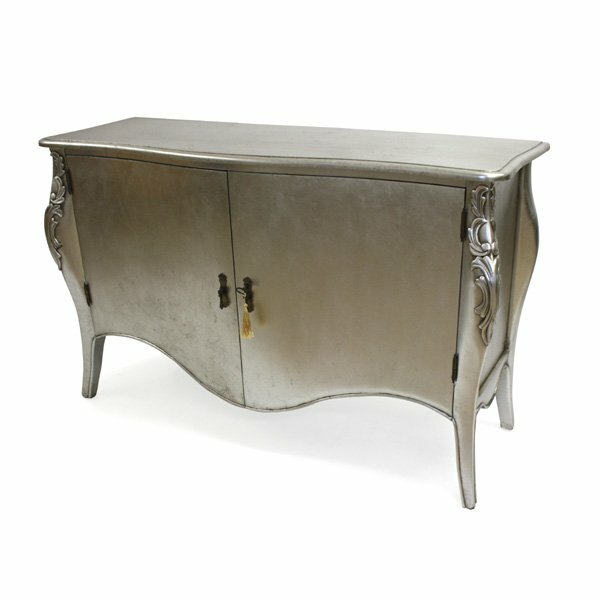 This silver console and mirror would look amazing in a large entrance hall – a dazzling example of opulence and grandeur. The black upholstered chair is framed by floral carvings, creating a stunning central feature for a room, or also an ideal item for a larger space where less decorative furniture would be lost. 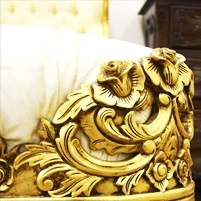 Finally the Gold Chest of Drawers – finished in stylish Gold Leaf, the floral carvings on this piece just complete the look emphasizing its beautiful elegant shape. Next up we have two painted bedside units with beautiful painted floral detail. These items are less ornate, but hold just as much of a presence in a room, but are softer and less bold. 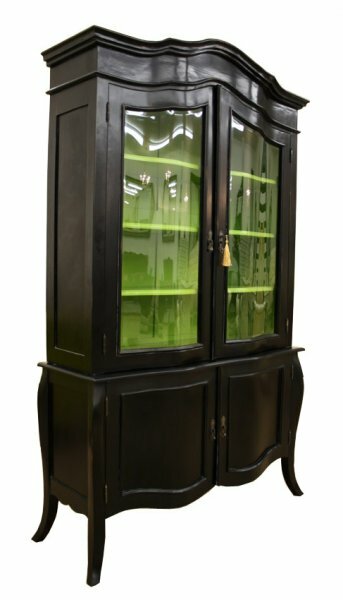 I love these two units – they would look perfect in a modern, country cottage style room, or even in a hallway as a stylish feature to hide away post/keys and place a vase of flowers on. They are the epitome of simplistic elegance, no fuss, just delicately curved legs and top, finished in white with beautiful painted detail. These charming units would befitting to small or large spaces, they have enough detail to stand out, but are not over the top to look too cumbersome in a smaller bedroom. Finally we have a stunning floral upholstered chair. This detail gives the chair an extra lift, ensuring it stands out in an understated way without blending into the background. The all black seat, accentuates the black leaf detail on the back panels, with the paler background flowers and colour softening and blending the design together. A chic piece for any home. Well, I hope you enjoyed the letter F – have a happy Friday, love Chichi. Well, its Friday and I’m sitting at my desk and its dull and dreary outside. We all notice colour, it sparks a response in us. Yesterday I commented on a friends scarf because I noticed it, it was bright and cheery and stood out. Colour lifts us and makes us take notice, its the same in our homes, a pop of colour lifts a space, its gives us a platform to build our creativity on, add one colour and it makes you want to introduce more – a vase of flowers, some colourful cushions – its fun. First up are 3 gorgeous shelf/display units, they are chic and elegant with the inside in a vibrant bold colour. This is a good way to introduce a block of colour in a contained manner, not necessary immediately obvious or in your face, but still a strong statement. The colour is framed and drawers your eye towards it. Next up we have the console/side table – an immediate splash of pure, vibrant colour, a great way to brighten up an entrance hall, kitchen or dark corner. Instantly noticeable. Finally we have ‘colour by upholstery’ – beautiful pieces in stunning fabrics that will add colour and style that can be continued throughout the room by way of curtains, cushions etc. Upholstery is great as it not only adds colour, but also texture.